Fortica 6 Seater Dining Kit in Black & White Marble from Nilkamal is a mark of luxury and elegance moulded into the form of a dining set which will make your dining experience more luxurious. This exemplary dining table measures 4 feet 11 inches in width, 2 feet 11 inches in depth and 2 feet 5 inches in height. Made from a combination of black and white marble, the dining table is strong and has a long life. The dining table top is made from strong, durable tempered glass that can withstand a lot of pressure as well as high heat. The dining chairs of the set have a width of 1 foot 5 inches, a depth of 3 feet 4 inches, a height of 2 feet 4 inches and a seating height of 1 foot 7 inches. Durable mild steel has been used to make the dining table legs as well as the dining chairs. The art leather used in the upholstery of the dining table is firm, durable, and provides luxurious comfort. 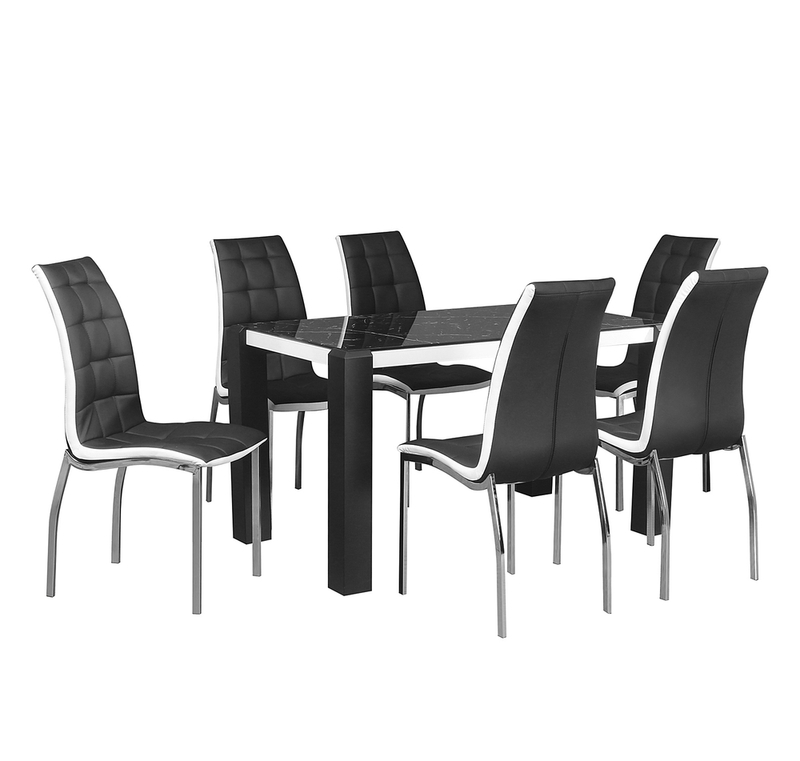 The Fortica 6 Seater Dining Kit in Black & White is an amalgamation of elegance, opulence and timelessness in a dining kit. Dine everyday like you are at a royal feast buy bringing home the Fortica 6 Seater Dining Kit from @home. Stylish Dining Set with Marble effect Tempered glass top.MS Chrome Plated legs.Ergonomically designed chairs with Cushion for Comfort.